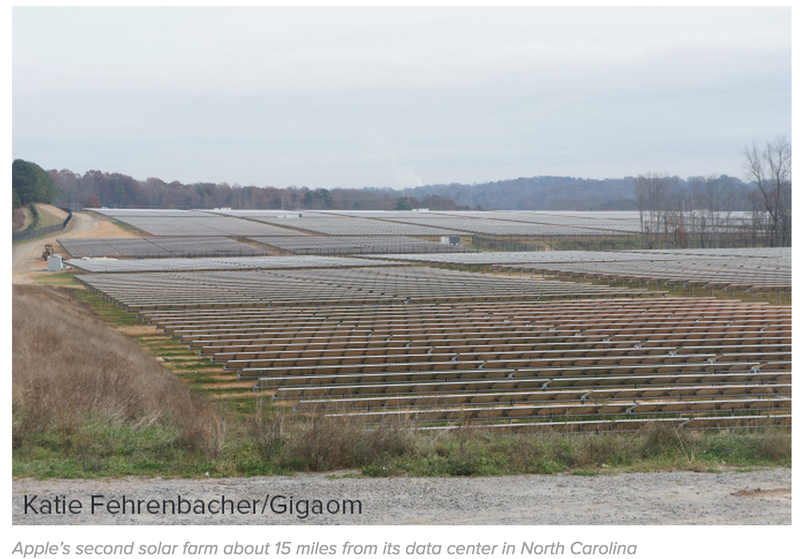 GigaOM today published a lengthy piece on the state of the solar and fuel cell farm installations that Apple has been building in North Carolina in recent years. The solar farm across from the data center has over 50,000 panels on 100 acres, and it took about a year to build the entire thing….Each solar panel on Apple’s farms has a microcontroller on its back, and the panels are attached to long, large trackers (the steel poles in the picture). During the day, the computers automatically and gradually tilt the solar panels so that the face of the panels follow the sun throughout the day. The above picture was taken in the late morning, so by the end of the day, the panels will have completely rotated to face where I was standing. The trackers used are single-axis trackers, which basically means they are less complex and less expensive than more precise dual-axis trackers. You can see in the above picture that the grass is neatly maintained. Apple manages the grass under the panels in a variety of ways, but one of those is a little more unusual. Apple works with a company that ropes in sheep that eat the grass on a portion of the solar farm; when the sheep finish grazing on one spot, they’re moved to the next. The full feature on GigaOM is worth checking out if you’re interested in Apple’s renewable energy projects.